The good thing about homemade dog shampoo is that it gives as good results as a store-bought shampoo. Other than saving your money, it becomes easy for you to keep a check on what you use. It needs to be noted that store-bought products for dog wash Calgary or elsewhere have certain products that dogs are not ready to withstand. Some of the basic ingredients that are typically used in preparing homemade dog shampoo are castle soap, coconut oil (for moisture), lavender essential oil (to fight fleas), rosemary (for moisture), and distilled white vinegar (to prevent smells). Although essential oils are a common ingredient in many of the homemade dog shampoos, one should avoid penny royal and tea tree oils, as they could harm a dog. Make sure to add only a few drops of essential oils when preparing a dog shampoo. Otherwise, the end result could be a scent overload for the dog. Given below are five homemade recipes to prepare dog shampoo that will leave your pup smelling fresh. 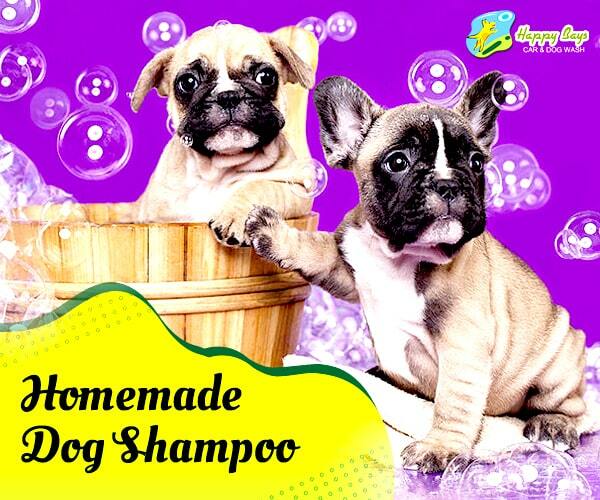 Preparing dog shampoo is a simple and easy process. Get some vinegar and dish soap which works in removing kitchen grease, and is a great ingredient to remove accumulated oils in the skin and coat of the dog. Make sure that the dish soap does not have a strong scent or any artificial additive in it. White vinegar acts as an anti-bacterial item and also works as a deodorizer, and helps in leaving the dog’s coat look healthy and shiny. However, be careful that vinegar, which is a mild acid does not get in the eyes as that may cause pain. If it does, wash the eyes with water. Oatmeal is a great healing and soothing product with pH balancing properties, and it is widely used in preparing grooming products. Dogs having allergies or dry skin would find oatmeal as a great item to get the necessary relief. Although you could buy oatmeal-based shampoo at any of the pet care stores, the cost could be pretty high. Instead, preparing your own oatmeal shampoo is quite inexpensive and easy. Fleas are a common feature with dogs. A great way to get rid of fleas is to use lavender essential oil in the homemade shampoo. You could also use cedar wood and lemongrass oils as anti-parasitic, antiseptic, and anti-bacterial, all of which are natural insect repellent. The use of shampoo with rosemary is a great way to get rid of stink in dogs. The moisturizing qualities of rosemary help in dealing with the dander issues of dogs. Rosemary is also an excellent item to treat fleas. Rosemary shampoo not only repels fleas but also makes the coat of the pet feel silky and smelling beautiful. The use of dry shampoos is a great way to rid the stinky smell of a dog without taking much of your time. The powder also removes any built-up oil on the coat of the dog. It must be noted that most homemade shampoos contain fresh ingredients and do not have any preservatives in them. Hence, try to use the shampoo within 1 or 2 weeks of its preparation, and make the whole into separate small batches. Keep your shampoo in a cool and dark place or in your refrigerator. When you use homemade shampoo for your dog, keep a check for any kind of reactions happening to the dog. And make your pet feel extra special by using its picture on the shampoo container. Regular bathing of your dog helps in keeping your pet free of parasites, a healthy skin, and get a shiny coat. Come to Happy Bays for dog and pet wash in Calgary and self serve your dog with a wash and pamper your best friend.